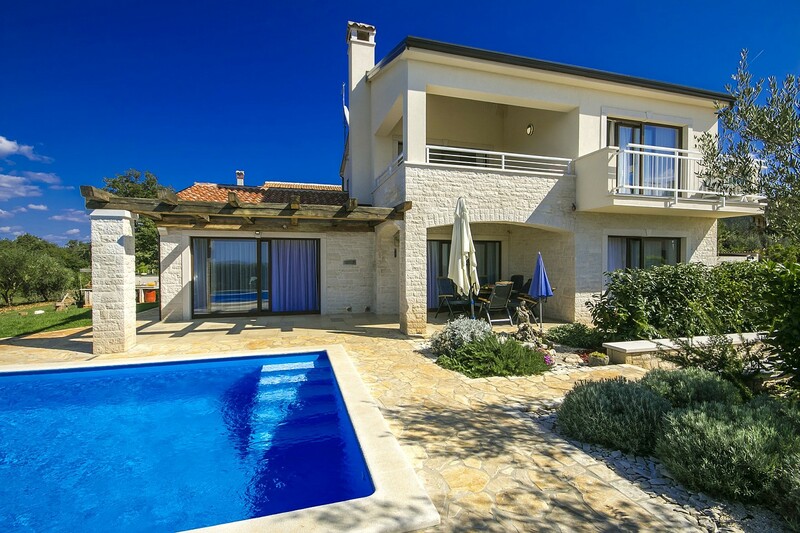 Villa Nira, a newly built villa with pool located at the edge of the village Barat in central Istria, approx. 15 km from Porec and its beaches. The villa has been built in the year 2015 and is situated on an approx. 2000 sqm enclosed property with lawn and olive trees with a nice panoramic view on the sea. The panoramic view is highlighted through the large windows in all rooms of the house. The village Barat is located 3 km from Visnjan, a picturesque town where we can find various shops, bakeries, restaurants/pizzerias, ATM and more. The villa Nira offers its guests the following outdoor facilities: private parking places for three vehicles, 36 sqm large swimming pool with sun chairs, a covered terrace with sitting set and barbecue. Holiday home for 6 persons of 160 sqm living area on two floors. It consists of the ground floor with fully equipped kitchen with dining area and spacious living room with a two-person’s sleeping couch, open fireplace and two exits on terrace, one air-conditioned two-person’s bedroom with double bed and shower/toilet, a separate toilet. On the first floor there are two air-conditioned two-person’s bedrooms, one with double bed, own bath/toilet, the other with two single beds, own shower/toilet. Both rooms have fantastic panoramic view to the sea and the green surroundings.